For those of you who regularly have guests over or who host a lot of parties, a home bar counter can be the perfect choice. Of course, a party can go just fine without one, but there’s a certain note of extra party readiness that can only be achieved with a great bar table. A personal bar will allow you to entertain in style and practice mixing drinks, adding extra excitement to any party. In addition, with a range of styles from modern and contemporary to traditional and ornate, a bar can match any furniture style. There are just a few more considerations to make. Outdoors or indoors? An indoor bar can be great if you live somewhere with inclement weather or live in an apartment or somewhere else without a proper backyard. On the other hand, if you have a pool, a beautiful garden, or both, why not show it off with an outdoor bar set? Most outdoor bars are designed to be weatherproof and UV-resistant, allowing you to have them out without worries – and, of course, they take up less space in your home. What to do for seating? While you can just have your guests go to the couch once you get your drinks, there are a range of convenient bar seating options. From modern bar stools to ornate high-backed chairs, there’s sure to be something to match your needs. What’s more, many bar counters come with matching seating to fit them perfectly. Bar chairs also facilitate more conversation between you and your guests. What sort of style do you want? Traditional bar counters can give an impression of sturdiness and add to the pub feeling of your space. Modern bar counters and bar tables provide a sleeker, smoother impression, making your space look fresh and new. 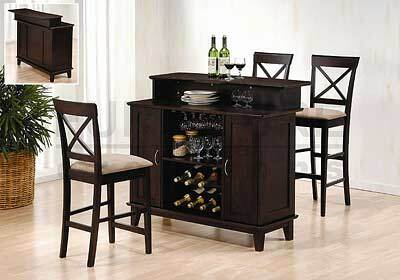 Once you’ve decided on the perfect bar counter for your home, call your friends over and celebrate in style! With a proper bar, your parties will be like nothing you’ve had before, and will be a lot more fun and stylish both. Enjoy being the best party host among your friends for a long time to come. This entry was posted in Contemporary Furniture, Dining Room Furniture, Events, Furniture, Furniture Stores, Modern Furniture, San Francisco Furniture. Bookmark the permalink.